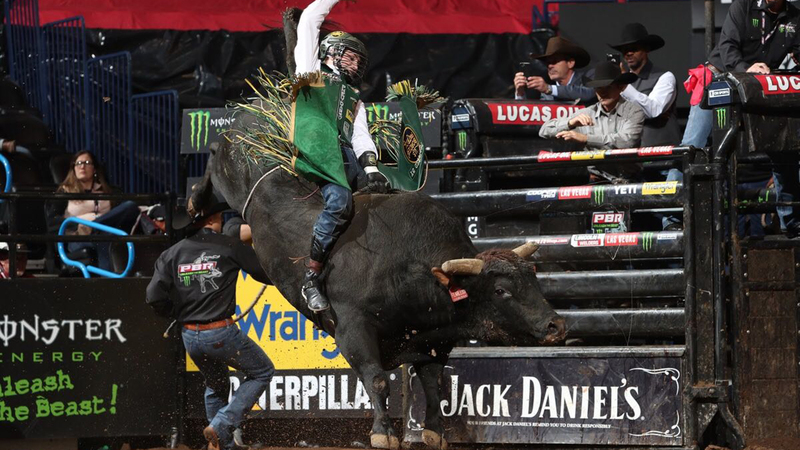 OKLAHOMA CITY – In a demonstration of his fierce power and brute force, Fearless made quite the statement Friday night during the 15/15 Bucking Battle at Chesapeake Energy Arena. Fearless ripped world No. 1 bull rider Jess Lockwood down in 2.75 seconds to earn himself a career-high 46 points. Lockwood dragged his bull rope to the locker room and could only tip his hat when asked about the D&H Cattle Company bovine athlete. Fearless has yet to be ridden on the premier series and is 11-0. He is also 23-0 at all levels of competition. H.D. Page said prior to the start of the Express Ranches Invitational Friday night that Fearless could be one of his sleeper bulls to sneak himself into the World Championship race. In a matchup against the best bull rider in the world and a PBR World Champion, Fearless backed up his owner’s talk in a massive way. Fearless needed only about two go rounds leaving the bucking chute before Lockwood was sent packing. The 5-year-old bull has champion bloodlines as well. Fearless is the son of former World Champion Bull contender and 2013 PRCA Bull of the Year Shepherd Hills Tested. Smooth Wreck also impressed in the 15/15 Bucking Battle and earned 45.5 points for bucking off Rubens Barbosa in 1.81 seconds. Oklahoma City was Smooth Wreck’s season debut. Fearless’ four outs is the most outs by the majority of the top bulls in the extremely early World Champion Bull standings. He is averaging 45.5 points per out and has bucked off Lockwood, 15/15 Bucking Battle and Round 1 winner Cody Jesus (6.58 seconds in Sacramento, Calif.), Luciano de Castro (7.97 seconds in Glendale, Ariz.) and world No. 7 Rubens Barbosa (2.12 seconds in Glendale, Ariz.) this season. “When the stars line up he is as rank as anything I have flanked, but he doesn’t always have that explosive rear,” Page said. Lockwood is already hopeful he can get another crack at Fearless in the near future.